The Productivity Meter isn’t just another tracker. This tool can help you gauge your progress towards goals in an innovative new way. It’s no secret that I don’t quite have my poop in a group. I’m ambitious as all hell, but I also tend to bounce around from one thing to another. And it ends up leaving a lot of ends undone. I hate that! I just want to do all the things. Have a successful Etsy shop. Build a blog that’s helpful and that I love– I think I’m doing okay here. Become a master yogi. Run a Youtube channel– that was a bust! And I know I’m not alone here. We all have hobbies and ambitions, but finding the time and putting in the work can be overwhelming. Well, I hate to break the bad news to you, but the work is still going to be there. 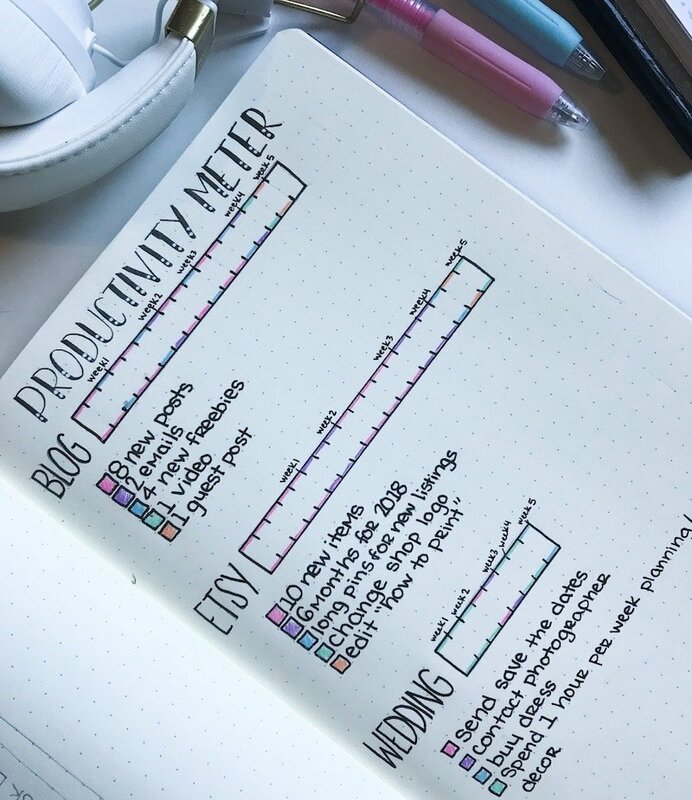 Even with this snazzy productivity meter, you’re going to have to put in the work. 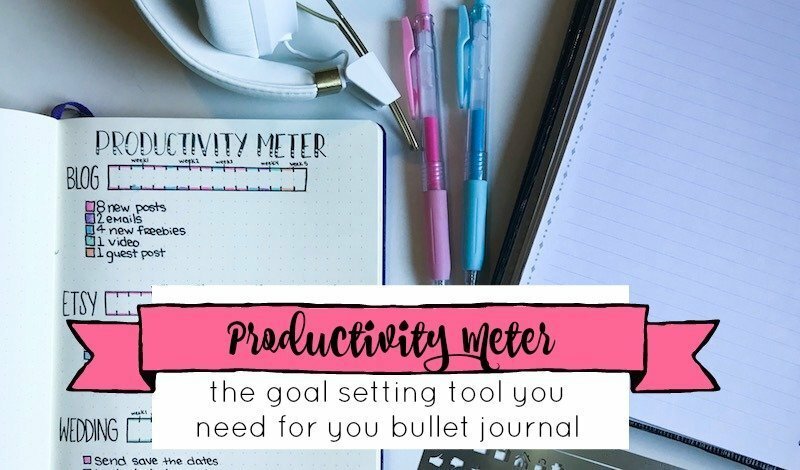 But, hopefully, this bullet journal tool will help you organize and prioritize your goals or tasks with a simple visual. What is the Productivity Meter? Broad goals or tasks are broken down into small specific steps. On the outside of the meter, you write in timeframes at which you want to complete each of the steps towards your goal. As you complete steps, you fill in the portion of the meter corresponding to what you completed. Sounds easy enough, amiright? It is. And while I don’t/have never claimed to be a girl-genius, I’m 90% a small lightbulb appeared about my head as I was designing this. If you end up using this tool, I would love for you to give me your feedback in the comments below or in an email if you would like it to be private. There’s a freebie coming up, so don’t leave just yet. You can use this for any time frame. Have a huge 5-year goal of buying a house? Yep, you can do it. Need to switch to a specific nutritional plan within a month? Yep, you can use it for that too. 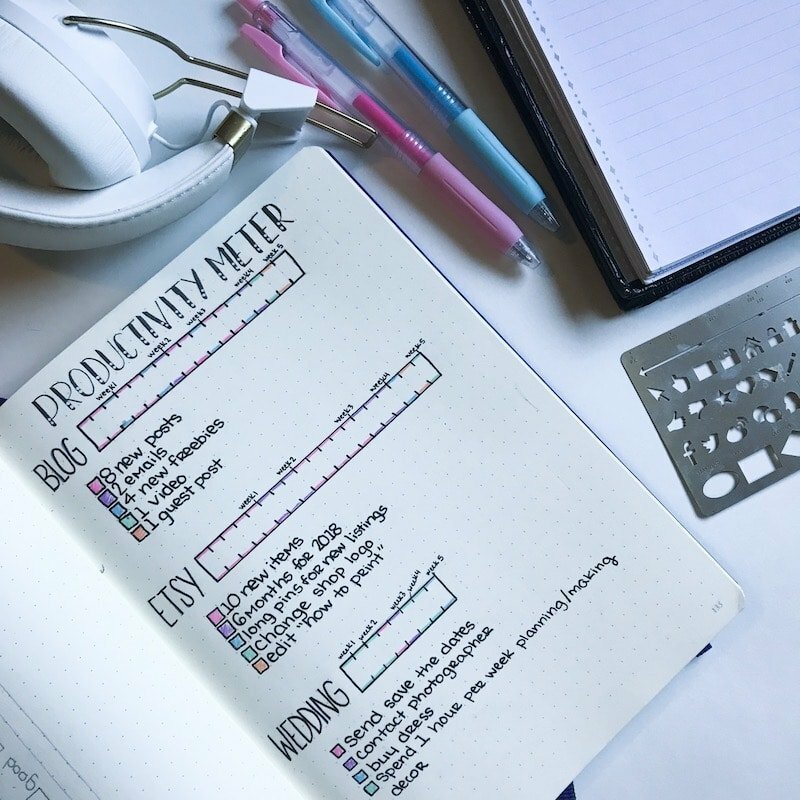 Want to add it to your daily log to layout your spring cleaning plan? Go for it. I’ve started adding it to my monthly pages as a way to keep track of my monthly goals. I have three meters in my November setup, representing goals for my blog, Etsy shop, and Wedding Planning. The top meter is for my blog, and I wrote BLOG next to the meter. Underneath it, there are 5 tasks I want to accomplish in November. I want to write and publish 8 new posts, send 2 emails to my subscribers, create 4 new freebies for the VIP Resource Library, make one video, and have one guest post on The Petite Planner. From here, I color coded each of those tasks. Pink for blog posts, purple for emails, blue for freebies, green for video, and orange for the guest post. The next step was to decide what order I wanted to complete these tasks. I knew I didn’t want to create 8 blog posts before sending one email, so it has to be broken up. I used the colors from my tasks to section off the meter. So now, my plan is to write and publish 4 blog posts over a period of 2 weeks and then send an email. I will repeat that same process with 4 blog posts and an email at the end of November. And then, because I consider the video and the guest post lower priority, they are to be completed at the end of the month. As I complete each task, I will fill in one corresponding section on the meter. So, when I’m done I should have 8 pink, 2 purple, 4 blue, 1 green, and 1 orange section. It’s totally okay if you end up not sticking to the plan and doing things out of order. Skip that section of the meter and come back to it. The overall goal is to give yourself a clear and concise plan of action, with a sequence and timeframe. But, life happens and things don’t always go as planned, so roll with it. Let me know if this is something you think you’ll add to your bullet journal pages? Is there anything you’ll change or add to it? 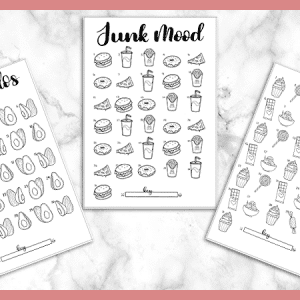 And, as promised… the free printable.
. It’s easy to write and color on. And you can print your page, cut it to size and then just stick it in your bullet journal without glue or tape. There are two versions included in the free download. You get a horizontal format, similar to what I have in my journal, and then a vertical format. 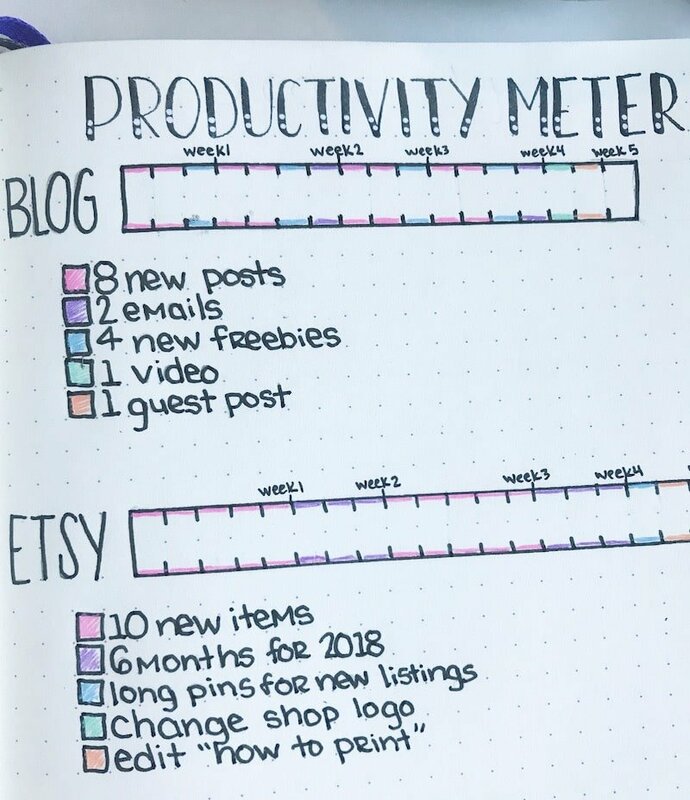 While I was designing this, it popped into my head that a small horizontal productivity meter may not be big enough or have enough sections for an annual or 5-year goal. You may have a lot more steps and therefore sections. Hopefully, the vertical meter will give you plenty of room to really map out your goals. To Download and print the file, just click on the link below. It will open the PDF in a browser and in the right-hand corner you will see an arrow with a line under it. Click that button, which will initiate the download. Once it’s downloaded, open the PDF with Adobe Reader (completely FREE, here), and print. Cut the page to size and add to your journal, planner, or binder. I’m curious about your thoughts on this tool. Let me know in the comments section. I can’t wait to hear from you. 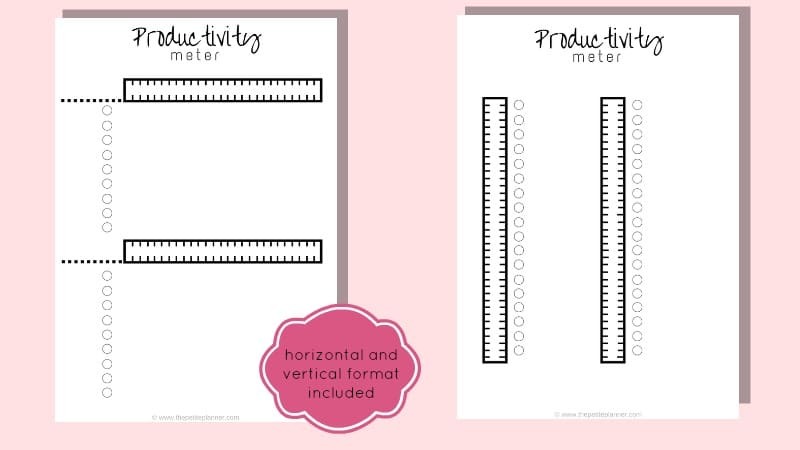 Join my mailing list and get instant access to all my of my Free Printables in my VIP Resource library.